Before leaving on this backpacking trip, it would be accurate to say that I was somewhat apprehensive. 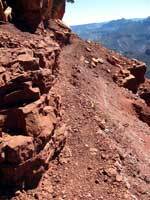 It was explained to me that when a trail is described in the trail guide as “exciting” or has “considerable exposure”, that is code for “you are walking along a cliff edge, and a slip here could hurt badly.” The trails that we had committed to were considered “extremely strenuous – for experienced Grand Canyon hikers only”, which of course I was not. And the fact that my quads had still become quite sore after my training hike the week prior to leaving did not inspire much confidence that I was actually ready for the big show. Our plan was to hike north down the Tanner trail from the east end of the Park on south rim to the Colorado River, then continue north along river following the Beamer trail, hopefully to the confluence of the Little Colorado, and then retrace our steps out. Then we would drive around to the wilder north rim, and explore the Nankoweap trail, the so-called most challenging trail in the canyon, for a day or two. I spent so much energy worrying about my readiness for the trip, that I didn’t get excited about what I would experience, until we arrived at the rim. If you didn’t know it was there, you would have no idea by looking out the car window on the drive to the Grand Canyon that it actually existed at all. The land is generally flat, with small stubby trees. Occasionally one would catch a glimpse of a small gorge cut out of the plateau, but nothing to indicate the grandeur that awaited us. 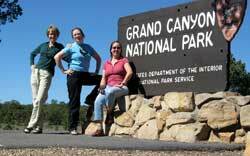 Even when the three of us reached the sign for the Grand Canyon National Park, there was no indication that the canyon was so near. 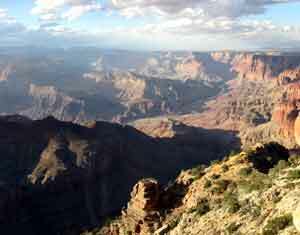 We arrived at the south rim mid afternoon Sept. 29th, set up camp in the Desert View campground. After eating lunch, we walked through the amphitheater of the campground to the rim, and I got my first breathtaking view. WOW! What struck me immediately was the size and beauty of the place. 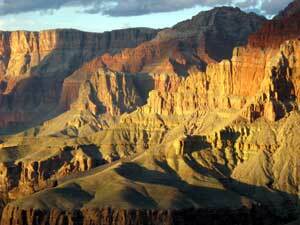 You know how people that have been to the Grand Canyon tell you that it is so big? Well it is SO BIG!!! No photograph can capture the vastness of the place – somehow it is too big for photographs. Not that that stopped us from trying. We then went to the Desert View Watch Tower, where we could see parts of the trail that we would be following the next day, and the Colorado River, our destination. At that time we did not realize that we would almost always be in view of the watch tower while we were hiking on the south side. We awoke to thunderstorms the next chilly morning. 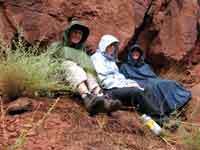 We were at Lipan Point, at the Tanner trail-head by 7h30am, but thought it best to wait out the storm. 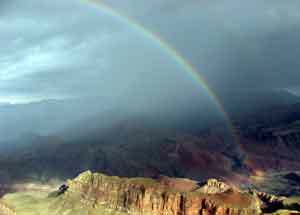 I got a great picture of a rainbow over the Canyon, and by 8h30 we headed down the trail through the juniper and pinyon forest. The trail was not nearly as difficult as I thought it would be. Yes, it was steep in places, but there were also long traverses. The path was very obvious the whole way, and I found that contrary to the creek beds that I was hiking on in BC that were filled with slippery, roly-poly rocks, this trail was made up mostly of broken, sharp scree, so my shoes practically stuck to the trail. There were no scary cliff edges. 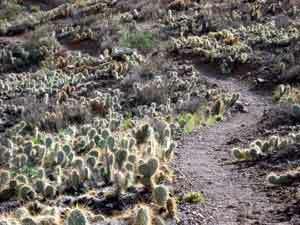 I imagine they call this trail very strenuous because in the heat of summer there would be no break from the sun, which would wear one down. But, we were hiking in October, and the morning was cloudy. We sat out another thundershower in our rain-gear half way through the morning, but after that the weather cleared into a sunny afternoon. The scenery was simply beautiful. Not only the cliff faces all around us, but also the huge red boulders that dotted the landscape, the black, twisted tree trunks, the cacti, the colour of the soil, which kept changing depending upon what layer of history we were traversing. 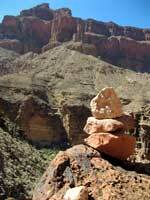 Even the rocks and small stones were crazy beautiful. You know those rock halves one can buy in gift shops where one side is a collection of crystals? Well, these kinds of rocks were lying on the path! I couldn’t believe what I was seeing. We got to the river about 5h30, set up camp, heated water to pour into our dinner bags, ate, and were in our sleeping bags by 6h30 or 6h45 because it was dark, and there wasn’t anything else to do. The next day we packed up camp and were on the Beamer trail by 8h30. The trail did not stay low, but rather climbed the cliffs above the river, and involved much going in and out of drainages. This trail was not as obvious, and since one in our party was French Canadian, we were looking for “inukshuks” rather than “cairns”. At about 1 o’clock, we came to a beautiful beach on the Colorado, which became our home for the next two days. It was hot, and we stripped out of our funny-looking safari outfits (we hiked in long pants and long-sleeve shirts to protect us from the vicious cacti, agave, and other thorny vegetation, as well as to protect us from the burning rays of the sun.) and into shorts and T-shirts, and spent a splendid afternoon wading in the ice cold water, doing laundry, and playing in the sand and mud. River rafters joined us on our beach that evening, and offered us food and wine – having already eaten, we enjoyed their wine. 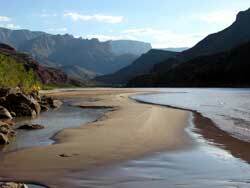 The following day our hope was to make it to the confluence of the Little Colorado. The guidebooks said the trip was long, so we set out early with light packs filled only with food and water. 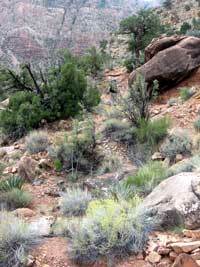 Once again, the trail climbed above the river 50 to 100 feet, and zigzagged in and out of drainages. 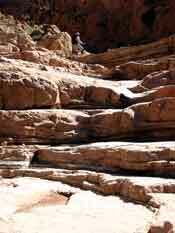 The drainages looked like big red-rock amphitheatres, complete with a stage and seating, and they were usually shady. I was developing a hot-spot on one of my toes, so we had a shoe-off break so I could apply moleskin. Shoe-off breaks in the shade became a treat. Such a pleasure to be able to wiggle one’s toes around! 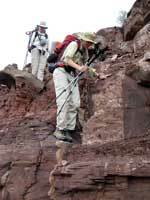 We had just come out of another drainage and were rounding a butte above the river, when we saw that the trail ahead of us was right along the edge of the cliff. SCARY! And this bit seemed long! We were stopped in our tracks, not sure what to do. Going forward seemed too dangerous to be worth while, going back seemed to be a shame, so we decided to try and find another way around the butte and meet up with the trail at the next drainage. So we climbed up and over the gently sloping butte, and after picking our way down the drainage, re-found the trail. I’m not sure how long our waffling indecision and detour took, but probably at least an hour. So, we were forced to turn around by about 1 without having reached the confluence, so that we would make it back to our beach before dark. We didn’t want to be walking on the edge of cliffs in the dark! The following morning we packed up our tents, loaded our packs with filtered Colorado River water, said a regretful goodbye to our lovely beach, and headed back the way we came to Tanner beach, and then up the Tanner trail to Cardenas butte where we were to camp for the night. After dinner I was regretting that I had not packed sandals on this trip, as I was dying to get my hiking shoes off my feet. My fellow trekkers suggested that I take the insoles out of my shoes and put them in my socks! Brilliant idea! My toes were free! I loved my slippers! We had the tent fly off that night, as it was clear, and there is nothing quite like lying in a sleeping bag looking up at a sky dense with stars. I was wishing I could remember all the constellations my dad taught me as a kid, but all I recognized was the big dipper on the western horizon. At about 1 in the morning, the wind picked up. Not just a little, but a lot. We thought that if we left our tent, the tent would blow away, and we even wondered if the wind would blow us with the tent over the edge of the butte! Happily, with the tarp off, the wind blew through our tent so it didn’t act quite so much like a sail, and it tempered the noise a bit. I don’t remember sleeping much the rest of that night, and packing up the next morning was a hilarious challenge. We took movies of the tent coping with the wind – pretty funny! The next day we hiked out of the Tanner at roughly noon, and immediately hit the showers at the campground, ’cause phew, did we stink! 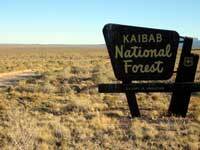 Driving to the Nankoweap trail-head on the north rim, we came across a big sign stating that we were entering the Kaibab National Forest, which I found to be particularly funny, as there was not a tree to be seen. Only open land with sage brush. Finally we got to the end of the dirt road, and we repacked our backpacks for the trek to the trail-head. They were predicting snow that night, and a low of 23 degrees, so we attached an extra fleece blanket each to our packs before heading off through what was looking more and more like that North Kaibab forest that the sign had announced. Two hours later we reached the rim, just before sunset. And yes, it was cold! We were decked out in our warmest clothes and jumping around in the dark and singing songs trying to get warm before slipping into our sleeping bags. We did not wake up to snow, thankfully, but it was definitely chilly. We ate our ziploc bag breakfasts overlooking the north rim and into the beautiful Nankoweap creek basin, and did not take off too many clothes before setting out on our day hike to Marion Point. This trail was very different from the other two we had done – it was very narrow and overgrown in places, different vegetation and a lot more of it, and footing was tricky in places, but it was also breathtakingly beautiful. This was the day that I had fretted the most over before leaving, as there is the famous scary bit where one is stuck between a rock wall and a cliff edge on the way to Marion Point. Falling there would mean certain death. I had decided to take a wait and see attitude, not being sure I would be able to coax myself to do it. But when we got there, somehow it was no problem, even though the path was only about 4 inches wide at the narrowest, and right at that narrow point was a big boulder that stuck out, which meant to pass it we had to turn in to face the cliff. I certainly didn’t enjoy walking that particular 15 feet, but we all managed it twice, as we had to take the same trail back. I honestly think that had we not done the Tanner and the Beamer first, I would not have made it past that point. Found it!! What a great adventure!! Thanks for writing it up for my vicarious enjoyment.